Looking for easy bathroom designs to update your bathroom? Continue reading here. There are many ways to update your dated bathroom decor. One of the first things to determine is your basic color theme you want to go with. I chose neutral bathroom colors for my bath vanity and granite counter tops. From there, it is easy to add any color you want. I'm known to change paint colors for my bathroom often. Much to my daughters dismay since she is the one I grab to help me paint. But changing your paint color is one of the easiest and cheapest design elements you can change, after all paint is fairly inexpensive and most bathrooms can be totally repainted with a gallon of paint. I would stay away from bright colors, while they are fun (I once painted my master bathroom to match a Mardi Gras poster I had) they tend to get overwhelming after a bit. If you have painting experience and want to try a faux finish for your bathroom wall color, something like this is very soothing. Don't neglect replacing your vanity sink when you are doing your bathroom updating. There are many types of sinks to choose from. I have become a fan of vessel sinks. I think that they are very stylish and just seem to add a touch of high end style to your bathroom. Of course, they also range from very affordable to very expensive. Check out some of the examples below that I found on Amazon. I was surprised how reasonable they were. If you decide to change out your sink and install a vessel sink, make sure that you get the appropriate height faucet. If you decide on an undermount sink, your choices for faucets are unlimited. While I really like the look of the oil rubbed bronze fixtures, I'm sensing from some of the design pros that it may be on it's way out. I went with the brushed nickel when I updated my master bathroom, that seems to be a timeless choice. 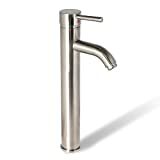 Of course chrome is also a fashionable look in bathroom faucets and other fixtures. Accessories are the easiest to change out at any time. When you paint your walls, keep the little paint cards in your purse or wallet. That way, if you are out shopping and happen to come across some fabulous item that you think will look great with your new bathroom decor, you have the paint color with you to make sure of the color match. Don't be afraid to hang wall art in your bathroom. I have a beautiful canvas print in mine, it was actually one that I had enlarged and printed from one of our vacation photos. It just happened to have the colors that I was targeting in my bathroom. So not only does it improve the look of my master bathroom but it makes me smile remembering a very nice time with my family. These are just a few ideas to update your current bathroom design, remember to try and coordinate your paint colors and accessories as it creates a more completed high end look. Add some wall art, a few accessories to your vanity to add some depth and a stylish sink, whether it be a vessel sink or and undermount sink. Sinks and basins with 24cm depth projection or less, made for tiny rooms like cloakrooms or waterclosets. These are a few tips on finding and installing them.